The FortiSwitch-108D-POE is a Desktop Form-factor Switch, equipped with 8 dedicated RJ45 Gigabit Ethernet ports and 2 RJ45/SFP combo ports. 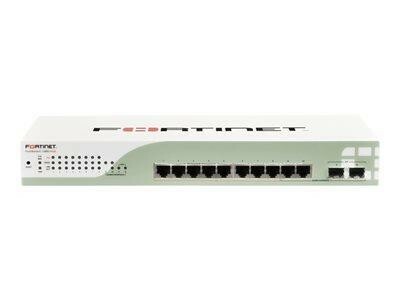 Perfect for extending the port count on desktop FortiGate connected UTM models, or to provide Secure Network Access to Wired LAN clients, the FortiSwitch-108D-POE is designed with the needs of the distributed enterprise or SMB in mind. The built-in Power over Ethernet (POE) ports enables the simple and rapid installation of POE capable devices, such as wireless access points and IP phones, reducing your overall network TCO. The FortiSwitch-108D-POE supports logical network segmentation and visibility, enabling the convergence of voice, data and wireless traffic onto a single network platform, while still meeting compliance requirements for data separation.